Crayfish vs. Crawfish: What’s the Difference? Home » Crayfish vs. Crawfish: What’s the Difference? If you have never tasted a good, authentic Southern gumbo, you owe it to yourself to find one and eat it. But first, you will want to know how to order this dish, so you don’t look silly in front of your friends and family at the restaurant. Oftentimes, gumbo features small animals that look like baby lobsters. These animals go by many different names, including crayfish, crawfish, crawdads, crawdaddies, mudbugs, and apparently even mountain lobster. Which one should you say when you’re ordering delicious food? Probably not mountain lobster, unless you are on an actual mountain and those words are printed on the menu. In any case, continue reading to find out whether crayfish or crawfish is the appropriate word to choose. What is the Difference Between Crayfish and Crawfish? In this post, I will compare crayfish vs. crawfish. I will use each spelling in at least one example sentence to demonstrate its proper use and context. Plus, I will discuss a mnemonic that you can use when you are not sure whether crawfish or crayfish is the correct word. What does crayfish mean? A crayfish is a small, freshwater crustacean that looks like a lobster. They can be found in shallow streams and riverbeds, as well as the shores of lakes. Jeremiah and Abernathy spent the whole afternoon catching crayfish at the creek. Crayfish are omnivores and breathe through gills. You must be careful to hold crayfish just behind the head, so that they cannot curl around and pinch you. Crayfish exist in North America, Europe, and Asia, and are often eaten or used as bait to catch larger animals. What does crawfish mean? Crawfish is a dialectical variant of crayfish, referring to the same animal. 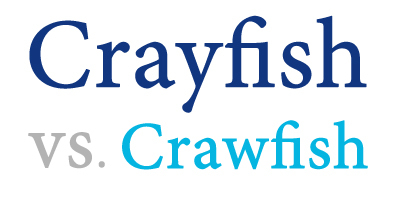 This spelling is derived from the way the word crayfish is pronounced by some English speakers in the American South. Crawfish has become accepted in American English, especially in the context of regional dining. A Cajun-style restaurant offering these animals in menu items would be likely to use crawfish instead of crayfish, in an attempt to promote or preserve regional authenticity. “The Louisiana Crawfish Gumbo at Bayou BBQ is excellent,” Karine said. Crayfish and crawfish are two different ways to spell the same word. In most contexts, including taxonomy, biology, and everyday use, crayfish is the standard term. Crayfish is also standard outside of the United States. In the context of regional cuisine, however, crawfish is more recognizable. Crayfish would look out of place in contexts involving Southern cooking, so even though crawfish is not technically standard, it is the better choice. If you don’t think you can remember this, here is a helpful trick to remember crawfish vs. crayfish. You can remember to reserve crawfish for regional dishes like gumbo since crawfish and New Orleans, a hotbed of American Cajun food ways, are both spelled with the letter W.
Is it crayfish or crawfish? Crayfish and crawfish are two spellings of the same noun, which refers to a small freshwater crustacean. These animals are prized for their use as bait and as ingredients in several Southern-influenced dishes; otherwise, they are sometimes considered invasive species. Crayfish is the standard spelling outside the United States, and in academic or scientific contexts in American English. In most food-related contexts in American English, though, crawfish is acceptable, and even expected. Since crawfish and New Orleans both contain the letter W, and are both related to Cajun food, you can use that letter as a mnemonic device to help you remember when crawfish is more appropriate. To summarize, crayfish is standard. Crawfish is dialectical, but culturally appropriate when referencing some food items. Other variations of the word like crawdad or mudbug are reserved as dialectal speech. Now that you know which one of these words to use, go out and order some gumbo! When you are done eating, be sure to check this site any time you encounter confusing words on menus or other reading material. 1 What is the Difference Between Crayfish and Crawfish? Sometime vs. Some Time: What’s the Difference?